The Naked Scientists have Christmas unwrapped with a look at the science behind our favourite festive traditions, including how to pick the perfect present, the psychology behind board games and how to avoid hangovers. Plus, Star Wars science, a chocolate-covered PhD and Santa's tech-upgrade! 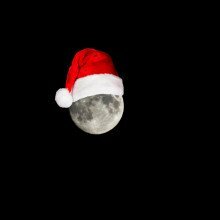 Could Santa use a tech-upgrade to save some time on Christmas Eve? Peter - Well I was amazed by this. I did some research on this and the numbers, of course, are huge because if you take the number of children on the planet (you've got about a billion), and we'll come to later which ones are not going to get presents because they've been naughty. He's got about 300 million miles to travel over the time when it's dark and if you extend it, with the Earth's rotation and everything, you end up with about 2,000 miles per second, which is 1% of the speed of light, that's 150 times faster than Voyager 1. And if you take the weight; say each gift weighs a kilo - seems a lot but let's say a kilo - then its half a million tons of presents which requires 5½ million reindeer to pull it along. And the total energy usage would be of the order of twice what the Earth would uses in a whole year. And of course also, if Santa was to stop for a mince pie and a glass of sherry each time, which he is supposed to do, then you've consumed bout 20,000 tons of mince pies (150 billion calories) and you'd be 50 million times over the drink driving limit. Georgia - Well we'll hear a bit more about how Santa would fail a breathalyser later, but first, that's an enormous amount of work for one man. Could technology give him a little bit of help? Peter - Well - I think there's a big problem, of course, travelling at that speed with air resistance, so I think he really needs to be travelling about the Earth's atmosphere and then send stuff down by drone, or by some means or other to get it down the chimney - you have to be very accurate of course. Also, as we're getting greener and greener, I suspect he really ought to become sort of zero emissions, which is a problem with 5½ million reindeer as you can imagine. Peter - Yes - so imagine they're doing, and other things as well I suspect, which will then re-enter orbit, won't it? The other issue of course, I did think about using LED headlights rather than normal, but it isn't that, it's actually the radar system that will do it, because of the amount of space debris up there. It's so huge, he would be running into things the whole time. Georgia - Outside of a sled, are there any other ways technology might give him a bit of a break? Peter - Well - I thought of drop off points, so he could drop off somewhere and parents could collect. A bit like some of the click and collect things we've got. But I think the big one, and this is slightly controversial is that perhaps he shouldn't be transferring atoms around to children, he should be transferring electrons around. Now with electrons, of course, we're getting more and more of that anyway, with downloads, and with music, and with money being transferred as well. But how about having a 3D printer in every home. So then you get something downloaded to the 3D printer, which could be a piece of jewellery, but it could also be food. I don't know if you've noticed, but there's more and more 3D printer foods around now. Georgia - So Santa could send you a 3D printed mince pie in return for all the many we've given him? Peter - Correct - exactly. Georgia - And what about in terms of, as you mentioned earlier, working out whose been naughty and whose been nice? Peter - Yes. It's pretty big; it's pretty dominant in the UK. The concept of not giving your child presents. How naughty do they have to be where you can let them down on Christmas Day? But I thinking perhaps we need some data behind this, and so the sort of data we could have would be social media postings if they're old enough. Surveillance - not so good. Tracking, you know, if they've been exercising. Mobile phones would give those tracking data. So, yes, the whole thing is a real can of worms when you can choose whether a child's naughty or not - so the answers probably no, so let's not go down there. Can reindeer have red noses, and do they really like carrots? Felicity - I'm walking through Scotsdale's Garden Centre and I'm here to find some reindeer. At the moment, what I can see are some dancing Polar bears, there's lots of Christmas tree decorations but, as yet, no sign of reindeer... After a bit of exploring, I found the reindeer outside, where I was joined by Laura Nadine Schuhmacher, a zoologist from Cambridge University, who explained how they cope with the cold. Laura - As you can see we have two male reindeers here. They are called Frost and Ice. They have very nice soft fur - feel this. Felicity - Oh, they are amazing. Laura - Yes, so their thick coat keeps them warm in the winter and they actually have special hollow hairs that trap the air and keep them really warm. And can you see this tuft of hair that they have kind of in their mid-neck? Felicity - It's almost like a beard under their necks. Laura - Exactly, and this keeps them extra warm because that's around their heart and vital organ area, so that provides an extra bit of warmth for them. Reindeer are known to have glowing red noses. This is not completely true that there's no light shining out of their noses, but their noses are specially adapted to the cold by having extra blood vessels that warm up the air as it comes into the lungs, so they can appear a little bit red. Felicity - So there's no real Rudolph but some reindeer, if they're feeling particularly chilly, might have a slightly red nose. Felicity - Frost and Ice seem very happy living in Cambridge but, in the wild, reindeer are found around the Arctic Circle where there is constant darkness in winter and the sun never sets in summer. Body clocks mean that most animals, including humans, are influenced by day/night cycles; this is why we get jet lagged. Apparently, this isn't a problem for Santa's trusty steeds. Laura - They don't have a circadian clock, so their body rhythm is different from ours. They are not very affected by the constant dark that they experience in the Arctic. Felicity - We're looking at these reindeer and they have the most beautiful, large eyes that are looking out at us and I'm wondering whether that might be an adaptation to the dark as well? Laura - Yes, so, as you can imagine, if you're living in constant darkness during the winter, you don't have the same light as you have in the summer when there's constant light. So their eyes actually change colour, which means they can increase the light capture during the winter by turning their eyes blue, while during the summer their eyes are golden. Felicity - I've been joined by Kate, who looks after the reindeer and she's gone and got some of their food, which look like pellets. They're extremely keen to get their food! They're right up at the fence, come to see us, and I suppose we should give them their breakfast. I note that you're not feeding them carrots. I've heard that reindeers are very fussy eaters but they seem to be enjoying this. Is this more natural food for them? Kate - Yes. They can't eat carrots because of the teeth they have; they have very, very small teeth only on the bottom row so they can't chew a carrot, but they eat this pellet food. They'll graze throughout the year- their favourite food is moss, lychen and things like that. Felicity - These reindeer have got some really spectacular antlers on their heads, but they're looking a little bit tatty. I understand these are both male reindeer. Laura, perhaps you could explain to me why their antlers are looking a bit rough around the edges? Laura - As you said, they have nicer and bigger antlers than the females. 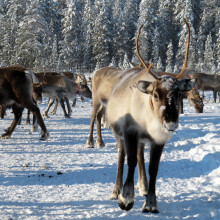 However, the male reindeer lose their antlers during the winter when it gets really cold, and the females don't. So if you're seeing a sleigh pulled around the sky by reindeer with antlers, these are probably female because male reindeer won't have their antlers any more at this time of year. Felicity - So it's girl power when it comes to Santa's sleigh? Laura - Yes, pure girl power, led by Rudolph, yes! Got yourself in a tizz buying Christmas presents this year? 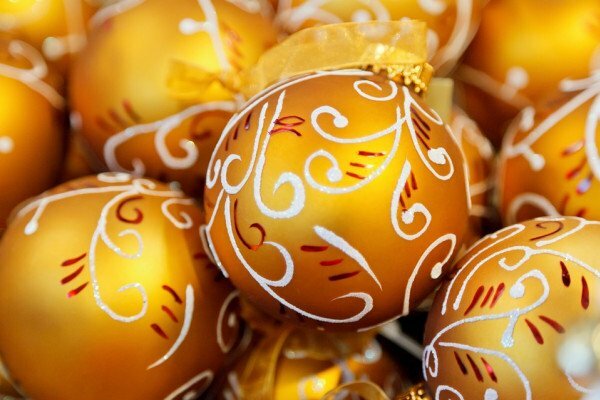 There are some handy tricks science can teach you to avoid gift-related stress! Connie - I've got to say, it wouldn't have been my first choice, though I am sure it will come in handy. It's a very useful gift and I think that's one of the things about gift giving is there's lots of social norms and, I think, pretty much everyone out there knows that you probably shouldn't get someone kitchen foil for Christmas because, for some reason, it's just not acceptable, it's too every day for a gift. But there's also just generally, I imagine, everyone's been feeling it this Christmas, a lot of anxiety around gift giving. It's quite stressful, and we spend a lot of time trying to put ourselves in the shoes of the person we're buying it for and, actually, it turns out mainly failing. Chris - So what you're saying is people are not intrinsically good gift givers? Is that your point? Connie - I think it's a bit of both. Basically everyone is a gift giver. Well, most people I hope are both gift givers and gift receivers but the thing is that you're in quite a different situation if you're the giver to when you are the receiver, and we're really not very, very good at putting ourselves in both shoes. 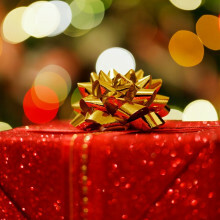 So, when we're receiving a gift we tend to like to tell people what we want, and they like it when they give us what we want. But when we're giving someone a gift, we ask them what they want and then we think you know what would be much more exciting if I got them a surprise. And then we think that actually is probably a much better gift because I spent a lot more time, you know, I thought about it, I wasn't just told, I went out and put the time and the effort in to get them a surprise, and then the person getting the gift goes - well you weren't listening, clearly, because I asked for something and you just didn't give it to me and is actually quite disappointed. We do it time and time again, even though when we're in the position of receiving that gift, we will have the same kind of like - you don't even know me at all, you didn't listen, you weren't thinking. I do it all the time. My mum is particularly good at telling me exactly what she wants for Christmas and I often just completely ignore her and get her something else. Chris - Go off-piste, quite literally. Chris - Would you like to hear what the Sunday Times suggests? They say there are five rules of giving - this is in the Sunday Times from last week. They said "choose a gift that reflects your true self. Givers and receivers feel closer if the present reflects the giver." That was their number one piece of advice. Their second piece of advice, "don't add a little extra when you give someone an expensive gift." American researchers have recently shown, in a series of experiments, that if you buy someone something decent, like a £200 coffee maker, don't add a free £5 get you some free coffee with this gift voucher on the side because, as they say, bundled gifts subconsciously end up with average the values. So in other words, when you see the gift and you see something posh, expensive and something cheap to go with, your brain settles on an average between the two and judges the gift to be worth about that. So don't devalue the posh car by chucking in, you know, a free valet with it because that's not going to buy you much cred. It also says "don't spend too much early on in the relationship and don't spend too little later" - it adds that cautiously. It says "young unattached men often view giving gifts as fiscal foreplay." I've never thought of it quite like that. "If you give something too pricey" it says, "it could be regarded as a sexual bribe." And also it says "don't give presents that could be a hint, because that could cause offence. Don't give people deodorant ofr Christmas because of what the message might be saying." Chris - So basically, what you're saying, Connie, is that the best thing to do is tell someone what you want. Connie - And get it, yes. I mean what we've got today, so Mike got £5 and actually there's also a lot bundled up in; we see gifts as having their intrinsic value - the quality of the gift. There's also a symbolic and so money is a really interesting one because when you're giving the gift, there's very little symbolic value in money - that's £5, I didn't do anything else, or put any time into it, its £5, but what they find with money is that actually people really like getting money. There's no thought in it, it doesn't matter and a lot of the time that's the thing. When we talk about' it's the thought that counts' it turns out that actually, the thought counts only to the giver, not to the receiver. And the receiver usually won't spend much time thinking about how much thought went into it all, unless they've given obvious hint. So, Peter over here, got a nice handmade piece. He's been told to think about all the thought in that piece, therefore, it's a good present. Chris - So be very grateful Peter. That's an extremely valuable work of art. Chris - You know a lot of thought went into that. Do you mind? Connie - Well, I was about to say, I've been given the cue that's there's no thought gone into that. So, again, I've been cued to think about the giver and what went into that, and I'm quite annoyed, personally. But most of the time, with a normal present, non-handmade or not really bad, you're not cued and people actually don't tend to put much time into thinking about it. Whereas the person on the other end has put so much time into it. And so I guess the main message here is that you don't really need to put that much time into a gift giving, just get people what they want and everyone will be happy, and we'll have a much easier Christmas. How do astronauts on the International Space Station (ISS) enjoy Christmas dinner? 23:37 - Good at board games: good at life? Why do board games bring out the beast in the best of us, and can they make you win at life? Mike - Well, I think they offer people a chance to practice skills that they wouldn't get in real life normally, so it's a bit like playing with animals, for example, kittens play fighting and that helps them hone their reaction times, and their hunting skills without actually threatening them. So, it's a bit like that with us, so when you play something like Monopoly, it gives you a chance to be a cut-throat business person and bankrupt your Granny without actually causing any long term harm. Georgia - Without actually ending up with a bankrupt Granny at the end of the day. If this is a form of kind of practicing real life, is there any evidence that board games can actually make you any smarter? Mike - There's a lot of different skills involved with board games and, if board games are a sign of performance in real life, then I'm doomed because I was really bad at the game of life; I always used to get bankrupted in the last few stages of the game. But psychologists have studied more serious board games, like chess, for many years and they've found that there's a lot of expertise associated with the game but that doesn't necessarily generalise to other games, but I think that just the general give and take of playing games and learning simple rules, does help children, for example, to develop their cognitive skills for later in life. Georgia - And why is it that board games... actually how are you guys getting on? Chris - We're already becoming property magnates over here. I own Angel Islington, so someone - who is the hat? Chris - So Connie owes me rent. Peter's already bought up the whole of Whitechapel. We're back in the good old days when you can buy Whitechapel for £60. Georgia - This brings me into, why does Monopoly make some people - I'm thinking of Chris here - so competitive? Mike - Well, some people might say it's down to testosterone, but I don't know if that's true. I think because it's like a simulation of real life; a lot of the rewards that we get from really winning, really getting money, still motivate us when we're playing games, so even Monopoly money can be motivating. Georgia - But they always seem to end in arguments. I'm hoping it doesn't today, but I know at my family home there's been dogs and irons thrown around many times in the past. Mike - Well, yes. People get very annoyed by cheating, for example. So most families have at least one person who's known as the' family cheat,' and there's some that argue that humans are specially geared up for spotting cheaters, so we're very conscious of rules when they apply to social behaviour, especially social contracts. So, because we live in social societies, we benefit from ultraism and the reciprocity of living in groups, but we also have to watch out for cheating, so we seem to be particularly sensitive to cheating even if it's only a game. Georgia - Can psychology actually help us to get better at games, win a little more? I'm thinking of cheating in a different way now. Mike - Well, it's funny, I was looking at an interview with a guy called Rick Marinaccio, who was the world champion monopoly player a few years ago, and he takes it very seriously and says he actually looks for his opponents weaknesses and exploits them. 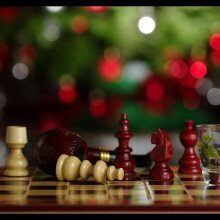 But in terms of things like chess, we know that to become an expert, you need to put in about 10 years, or 10,000 dollars of practice to become something like grand master. The holidays are the perfect time to relax in front of a film, or a dose of festive telly. 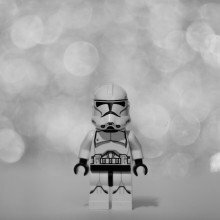 This December saw the release of Star Wars: The Force Awakens, which is smashing box office records. Can films serve as more than entertainment, and end up inspiring scientists? Graihagh Jackson grabbed some popcorn with Cambridge University's Karen Yu, who explained how her love of the films first got her into science. Graihagh - We're sat in the Picturehouse in Cambridge. Everyone has just flocked in to see Star Wars, the latest movie. You saw it earlier this morning and I believe you're a big fan. It's actually how you got into science in part. I wonder if you can tell me that story. Karen - Yes, so I was around nine or ten at my local library and drawn to the science fiction section and I saw a copy of Star Wars - it was a novelisation of the first film. At the point I hadn't seen the films yet, but I picked up the book. I had heard of the series, and I read it and from that I was pretty hooked. I saw all the movies and that wasn't enough so I read a lot of the expanded universe stuff from there and then, from that, lots of other science fiction as well. Graihagh - What was it about it, in particular, that drew you in? Karen - All the things that they could do; from visiting other planets, meeting all the strange and new alien life forms, interacting with them, and all the interesting technology - hover cars for example. I remember being stuck in traffic and being well like, why can't our cars hover and fly and we can avoid all this? And questions like that made me think well like, why don't we have that technology and how can we get that technology? Can I help to do it? Graihagh - And that's what brought you to where you are today? Karen - Yes. Originally I had very grand designs; some fusion powered starship engine, but my goals have tempered a little bit since then. Currently my project involves laser processing, and controlling that and attaching feedback and monitoring, so that the processing for micro and nano scale components is a lot more efficient. Graihagh - So not the future of hover cars then? Karen - No, no. I still get to work with lasers which is also pretty cool. Graihagh - You've seen the most recent Star Wars. What did you think? Karen - I had a great time. I think it captured the feeling of the original trilogy a lot better than the prequels did, and that feeling that you get when the trumpets start blasting and the text starts scrolling across the screen and you know that it's begun. I think that alone was worth the ticket but the film was excellent, quite yes wonderful. Graihagh - Did it reinvigorate your love of science? Karen - I like to think that that never left but yes, given the rate of my PhD, yes it has a little. Graihagh - Do you think that's the same with a lot of people? Getting young people into science, things like Star Wars and other science fiction movies really help with that? Karen - Oh yes, absolutely. It just fills your imagination with all these things and I think I'm certainly not the only one to think well why can't we do these things? When kids ask these questions they start thinking about well how can I help, and how can I get into science and make my dreams of having a hover car come true? Graihagh - Do you think it matters that they're incorrect scientifically, if that makes sense? 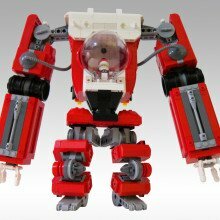 Karen - As a scientist and an engineer, when I see certain films and they play fast and loose with the science, it does bother me a little bit as I'm sure it bothers many other scientists and engineers. But that being said, there is something about just leaving it open ended, not explaining everything and leaving it to the imagination, and the stuff that we can't do right now is what's going to inspire the kids who are watching it. Graihagh - One last question. It's a serious question okay. What's your favourite Star Wars film? Graihagh - Oh, it's a toughie, I can see. Karen - The new ones great but I think it would still have to be "Empire Strikes Back." I'm sorry. Graihagh - And favourite Christmas film? Karen - That's another hard one. I guess, as odd as it sounds, it would have to be "You've Got Mail." Graihagh - "You've Got Mail?" Karen - Yes. It's always on TV, and I always end up watching it with my mum around Christmas, so it's just kind of like our Christmas film. Adam - We are trying to answer some science questions about chocolate fountains. 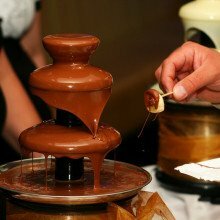 So a good one - the next time you look at a chocolate fountain, as we see here, you can ask "well why when the chocolate falls off the chocolate fountain, does it fall not quite downwards but slightly inwards?" Chris - And then it drops onto the one underneath it, but when it does so, it doesn't fall straight down like water dripping off the edge. It actually goes inwards a bit and then down. Adam - Yes, which is weird, because gravity normally acts downwards, so in this case it's going inwards. So me and my supervisor, we looked at this and thought "okay, well what's going on here?" Chris - It's important to know that there's key science going on in laboratories around the country looking at important physics principles like chocolate fountains. But no, I mean more seriously, there's obviously something doing something to this fluid and, more broadly, understanding how fluids move and behave is important isn't it because there are many applications beyond just chocolate fountains? You're using this as simple model but there are lots of reasons why this is relevant to everyday life in other respects? Chris - It tastes better though. Chris - I don't think I will actually. I'll leave that to you Adam. Chris - If you do not shake the bottle, none comes out and then a lottle. Adam - Yes, exactly. So ketchup has this weird property that it's quite thick and you can't get it out of the bottle but you need to shake it to give it some sort of sheer before it starts coming out, and chocolate behaves in much the same way. Other things that behave this way, so say mayonnaise, lava, nail polish, blood - blood behaves this way. Chris - You don't eat most of those things do you? Adam - No not so much. Chris - I'm just kidding. But how did you apply physics and maths to this question? How can you actually take something like a chocolate fountain and start making mathematical equations to describe that. Adam - Sure, so we have one big equation that tells you how every fluid moves - it's called the Navier-Stokes equation, it's really important, and it looks horrible, and what you do is you ask "what's really important in this equation is the viscosity. How does the viscosity change as it goes through, in this case through the chocolate fountain?" So what you look for is trying to figure out how does the viscosity...basically, how can you describe the viscosity? So you stick that into the equation and try and get some answers out of it basically? Chris - So is that what you did? You now have equations that will describe how this fluid in this situation, moves? Adam - Yes, so obviously chocolate is a million, possibly billion pound industry and so people have done experiments with chocolate and they can tell you exactly how the viscosity changes as it goes round, and so we try to look these up and convince people to give us some data, and we stuck it in and we got some predictions, and they seem to be pretty good from our kitchen experiments. Chris - Well you know what they say Adam - proof is in the eating, the proof is in the pudding. Shall we have a go? Adam - Yes, so help yourself. We've got some bananas, we've got some strawberries, and we've got some marshmallows. Chris - There's a large queue forming behind me as well. Adam - You're not lying. Chris - Come on, show us what we do. Come on let's go for it. Chris - Especially if it falls off like that has. It's gone down inside the machine. Adam - Yes, but you get full coverage this way which makes it very good and then you stick it in your mouth. Chris - I think we should let the ladies in because Connie looks like she's about to murder somebody if we don't let her get near it. What are you going to go for? We've got banana, we have strawberry or we've got marshmallows. Connie - I'm going to do what the expert said - I'm going to go for a strawberry. Chris - Is there a mathematical equation to describe how the chocolates coats the fruit or the marshmallow item? Adam - Yes. So, coating is a really important problem because if you're, for example, an airplane manufacturer and you want to paint your aeroplane. Well this is a coating problem because you end up with a nice thin sheet of paint, and paint: that behaves the same way as chocolate which is amazing. Mistletoe, associated with stolen kisses at Christmas, has a not-so-romantic life cycle. with Alex Summers, Cambridge University Botanic Gardens. If you're planning to steal a kiss under the mistletoe this Christmas take note: this plant may be beautiful but its life cycle (depending on your world view) is not such a romantic process. The parasite hijacks other plants and animals to reproduce, as Ginny Smith found out from Alex Summers at Cambridge University Botanic Gardens. Alex - So at this time of the year, if you look into the gardens, you'll see adorning the trees. Hawthorn, apples, or any of those Rosacea genus, you'll definitely see mistletoe in those trees. Ginny - So we're looking for deciduous trees that shouldn't have any leaves on but actually have big balls of greenery effectively? Alex - Yes. This time of year the mistletoe really does stand out. Ginny - Okay, so let's go have a look then shall we? We're going a bit further into the Botanic Gardens now. I'm walking past a beautiful pond full of ducks on one side and a lovely rockery on the other side, and I've just spotted a tree in the distance there that looks like it might have some mistletoe on it. Alex - So that is, indeed, mistletoe. Ginny - How does mistletoe spread? How does it get so far up into those trees? Alex - So mistletoe is bird dispersed. The berries are eaten by, particularly, thrushes and the main outer part of the berry is removed but the sticky substance that's around the seed remains. When the bird defecates, the seed is left on a branch and that sticky substance allows it to stick to the branch. The seed then produces three appendages that make it look like a spaceship and these allow it to attach to the branch. The plants that you see in the tree will probably have started as one initial founder plant, and then mistle thrushes and other thrush species generally and will have turned up and moved the plant throughout the tree. This plant is doing something that's very different to most of the one's that we're used to. So from the tree, it will be getting a number of things through a special attachment, called a haustorium: mainly water and possibly some other nutrients, irons and salts. 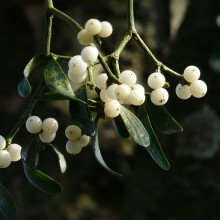 Ginny - What are the benefits to mistletoe of being a parasite rather than being a normal shrub? Alex - All plants are competing for one major thing, which is light, but one way to get around that is to elevate yourself on another plant above the canopy. But not only can you get the light more easily but, if you plug into that plant, you can also steal water and nutrients that you would have had to work to get if you planted yourself into the ground. Ginny - Does it damage the tree that it grown on? Alex - Absolutely. The plant is taking water and nutrients from the tree and, therefore, the tree is losing out. However, one or two mistletoe plants are not going to do major damage to a tree. Ginny - Shall we go a bit closer and have a look at some mistletoe? Alex - Yes, let's do that. Alex - If I cut this little bit off here, and we can actually see here this dichotomous branching and that creates that very traditional mound like structure within the trees. At the branching point there, we can see this is a female, so it's got three berries at each point. Ginny - I've never noticed quite how perfectly it splits in two, and then two again, and how that gives you that perfect sphere. Why does overindulging leave you feeling so awful the next day, and can science help you avoid a hangover? John - It makes you drunk because the body's treating it as a toxin - it really doesn't want this. I mean we get a little bit of alcohol from our intestines every day and the body wants to get rid of it, but if we give it a lot then some rather nice things happen because some of the alcohol replaces the water along the central nervous system. So we feel more relaxed, less inhibited, so we can say things we wouldn't normally say, and it can all be jolly friendly and wonderful, which is what you want at Christmas of course. Georgia - And then the less wonderful part comes - the hangover. 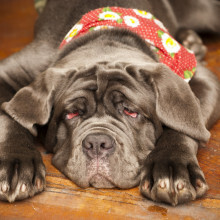 Why do we get hangovers? John - Well, the trouble is of course, as I say, the body regards alcohol as a toxin, it wants to get rid of it and it's got an enzyme called alcohol dehydrogenase, which attacks the alcohol and turns it into something called acetaldehyde, and that's a really nasty chemical which then produces all the symptoms of a hangover: headache, nausea, tight chestedness, feeling sick. So when we wake up in the morning, when the level of that is quite high, we've got a typical hangover. Georgia - I know the feeling well. But is there a way, short of not drinking anything, that we can avoid a hangover. John - Well, a few things. First of all, don't drink on an empty stomach. So, if you're going out for the evening, you're going to go to something, have a glass of milk or something like that so you're not drinking on an empty stomach. And then during the course of the evening, whatever you're drinking, perhaps occasionally have a soft drink or something with no alcohol in it, because you've got to try and counteract the dehydration that's going to occur which will make the hangover worse. Georgia - And what's the ultimate hangover cure in the morning would you say? John - Well, when you get to the morning, the only thing you can do is grin and bear it until the level of acetaldehyde has gone down which will be about midday. So you can help that though by having a proper breakfast, and the best think you can have is, say something like toast and honey because then you're supplying the body with things that have become depleted as it's been attacking the acetaldehyde, so it will do that more efficiently. Georgia - Why are some drink worse than others at making you hungover? I'm thinking now especially of port which, essentially, is a hangover in a bottle. John - Yes, I know what you mean. The thing is, of course, some drinks, especially coloured drinks, contain lots of other things like polyphenols which, again, the body doesn't really want. I mean these are quite useful in some respects but not particularly good in terms of the body dealing with them. And, of course, the darker the drink the more you're likely to have these other unwanted chemicals. Acrylene is one, for example, that's really nasty. Its low levels in most drinks but in the coloured drink it's a slightly higher level of it, and so avoid the coloured drinks. The best thing is to stick to gin, of course. Georgia - Oh well. I'm happy to do that. John - Well the reason for that, of course, that's doubly or triplely distilled alcohol and I know it's distilled from various herbs and spices, so you get a little bit of a flavour with it but, basically, it's quite a clean drink. And, of course, if you have that with something like tonic, you dilute it (perhaps one part gin to three parts tonic or something), then you're getting a fairly balanced drink then which isn't going to leave you too dehydrated. Because the think about alcohol is it affects various organs of the body and it makes it easier for the body to get rid of water (as we always know), and that, of course, is going to lead to dehydration which is going to make the hangover worse in the morning. The best tip I always give people is, before you go out drinking, put a pint of water on the table in the kitchen or by your bed and drink that before you go to sleep. Georgia - Is there any truth to the old saying "hair of the dog that bit you?" Can drinking the morning cure your hangover? John - It may help a little bit, especially if you have a very dilute drink, but I think if you find that you always get that effect in a morning then it's a sign that you're getting towards alcoholism. So a "hair of the dog" might work if you're in that state but, otherwise, it's better to have just a non-alcoholic drink in the morning. Georgia - And how long does it take to process alcohol, both in terms of getting rid of a hangover and in terms of how long it takes you to sober up? John - Well, it takes the body about an hour to get of one unit which is ten grams of alcohol, so a small glass of wine or half a pint of beer is one unit. But, of course, the thing is once you start drinking, you perhaps tend to drink more than you realise and, of course, when you stop drinking, it's going to be longer and longer before you can safely have a level which would allow you to do something like driving. 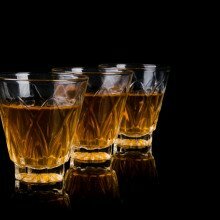 When you're drinking can you really tell when you're over the limit? The Naked Scientists get breathalysed! Drinking impairs most of your motor-functions, but also your ability to analyse how drunk you actually are. This can be a massive risk over the festive season, with people electing to drive when they are over the legal limit. The Naked Scientists are caught drinking by PC Andy Coop, armed with his trusty breathalyser, who explained just how the police try to prevent drink driving over the holidays. Andy - A high percentage of people who come into contact with the police the following morning are unaware that they're driving in excess of the drink/drive limit. Chris - Now Adam - we actually gave you a rather interesting Christmas present here on the show and you drank a pretty healthy half bottle of your Christmas present - you have consumed brandy. Did you feel impaired at all? Adam - Well, I feel quite smooth. PC coop is making me doubt myself. Chris - How did you think the interview went? Did you feel impaired at all? Adam - I thought my interview went very well, thank you. Chris - So, you would have been comfortable probably to drive yourself home, do you think, this evening if you'd been in the car? Adam - No. I feel a bit hazy so I think I would have relented or taken the train or something like that. Chris - Are you just saying that because you've got police officer sitting opposite you? Chris - But this is about the size of a big mobile phone and it has a pipe that you've just attached sticking off the side of it. Andy - This is a Dreger roadside screening device that we as the police carry in Cambridgeshire and, basically, it's a screening device. It give us an indication as to whether the individual we've stopped at the roadside is over the drink/drive limit. Chris - How does it actually work? What's it measuring on Adam when we do it? Andy - When Adam blows through the tube, it's timed to allow him to blow long enough through the device to get the air from within the bottom of his lungs, so it's not taking the air from within his mouth that's obviously a stronger content of alcohol. So we're looking at what's already been absorbed in his system. Chris - So, basically, the alcohol that's in your blood, Adam. Some of that alcohol dissolves in the air in your lungs and so when you breathe out nice and hard and blow into this wonderful device, you're going to impart some of the alcohol in you into the device. Do you want to pretend you've just stopped Adam then, Andy and take him through the procedure? Andy - Okay. Hello sir so obviously we've stopped you this evening. You've come through out drink/drive checkpoint. Now have you had any alcohol to drink today? Andy - Yes, okay. I can smell it on your breath anyway as I'm talking to you. So I'm going to require you to provide me with a specimen of breath. I must tell you that failing to provide me with a specimen of breath, along with a positive specimen will render you liable to arrest and subsequent prosecution. Okay, do you understand what I've said? Andy. Okay. Just seal your lips around the tube. Form a nice seal and blow long and hard through the device until I say stop. So, when you're ready, blow. Keep going, keep going, keep going, stop! Thankyou. So that will analyse the breath that you've provide me now and then we'll get a reading up there. You've actually passed the test but it has detected that you've drunk alcohol. So, on this occasion we'd obviously let you carry on your way but with words of advice. Chris - It says 22 micrograms per 100mls. What does that mean? Andy - That says that that's detected 22 micrograms of alcohol in his breath. So, obviously, the legal limit is 35 so at 22 micrograms of alcohol is an allowed level for him to drive albeit it does detect alcohol in his system. Chris - Georgia's had a little bit to drink a little bit more recently. So do you want to have a go Georgia and just see how more recent consumption affects you? How much have you had? Georgia - I think I've had slightly less than Adam has but yes, I've been enjoying a bit of brandy. Chris - I can smell it! As PC Coop says, you can definitely smell it. The whole studio stinks of brandy now. I hope you gave her permission to help herself. She's been stealing, stealing your brandy. Georgia - It was a stressful show. Andy - I'll just go through the preamble on the machine. That's where we would normally enter the subject's gender, their age and the reason for which we're obtaining the specimen. So, that's ready to go, so seal your lips around the tube and blow until I say stop. Stop! And again, because that hasn't immediately returned to zero reading, that's detected alcohol in your breath. Chris - Ooh! There's these massive black letters that say fail. Ohh! 44 - that's well over Georgia. How much did you have? Georgia - I didn't think I had that much. Andy - That's accompanied, obviously, with the red indication light there for people to see that they've failed. So if you'd been stopped by us on one of our checks or for something as simple as a stop light out, or a headlight out, you'd find yourself being arrested now and taken to Police Station. Chris - Good grief! Is it possible that it could do a false positive? Andy - No. Because we would get to the bottom of that. This is a screening device. They would come under on the evidential machine in the custody suite. But if we're going on what we saying Georgia has drunk earlier in the evening then, obviously, that just shows you that her body's dealing with the alcohol content differently. And if we're saying that they've both drunk the same that's put her over the limit, whereas the other test was under. Chris - Are you surprised? Georgia - I'm really surprised. I thought I had a lot less than Adam did and I feel fine as well. So, I don't think I'd have hopped into a car but I'm quite relieved it's not illegal to drink and radio. Previous Why Do Dogs Slurp So Sloppily?